On Saturday June 20 comrades from the CPGB-ML participated in the lively and well supported demonstration against austerity in central London organised by the People’s Assembly and backed by many national trade unions, notably Unite. Although the Labour Party, as is known to everybody, completely backs the conservative government’s austerity agenda, it opportunistically, having lost the election, backed the anti-austerity demonstration in an attempt to cash in on the anger of the millions around the country who are suffering from swingeing cuts in social spending. Not surprisingly, a number of Labour MPs were in attendance, including a number speaking from the platform. 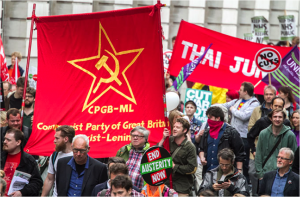 London Region members of the CPGB-ML ensured party stalls were set up early in Parliament Square and at the Bank of England assembly point from 8am and these pitches were bolstered throughout the day as comrades and supporters from across the country gathered. Close to 250,000 people were in attendance, many thousands packing out the Square and the surrounding streets, stretching back down Whitehall for some considerable distance as speeches began in the early afternoon. Labour Party stalwarts and leadership “hopeful” Jeremy Corbyn did their bit to rally Labour supporters to back his campaign for the Party leadership , joined by the counter-revolutionary Trotskyite and revisionist renegades in making similar calls. Mark Serwotka, General Secretary of PCS, in an effort to drum up support for the imperialist Labour Party, asked the thronged masses to imagine what they could achieve if all those assembled joined the Labour Party and voted for Corbyn. Mark Serwotka’s remarks are nothing short of sickening, considering the millions the last Labour government slaughtered abroad in its imperialist wars against the oppressed peoples and the millions it subjected to austerity at home. Yet, as a sign of the continuing grip of social democracy upon the movement, thousands nodded along to Serwotka’s suggestion and many cheered in agreement, and no doubt a good many others will have put this master plan into action the minute they returned home, taking the struggle against austerity to the next, glorious dead end. Comrade McGuiness might justly have added that Labour, had it won the election, would be just as vicious in attacking ”	fine, hardworking, proud and decent” working class people – not to speak of the oppressed abroad. “Our tasks remain the same whoever gets elected: to build a strong party, to create deep links with the masses, to spread an awareness of the real cause of workers’ problems … and, above all, to expose and kick out the charlatans who tell people to hope for a Labour (or other ‘fairer’/’greener’) bourgeois government and who tie our movement to the ruling class’s coat tails in a million and one ways. As Marx famously said: “theory becomes a material force as soon as it has gripped the masses”. When we bring mass organisation together with a scientific knowledge of the world, there is nothing that can hold us back. Marxism Leninism is the science of the working class – it is the weapon that will enable us to organise effectively, not only to stand up for our rights under capitalism but also to finally overthrow this rotten, bloodthirsty system and build a socialist society, where planning for people’s needs replaces profit as the motivator of all production. Humanity faces many problems today, but they all have known solutions. We have the technology, and we have the resources and creativity to solve our problems and to build a truly fulfilling life for every human being on the planet.